How is the fact that most Ukippers and Brexiteers are ordinary, decent people and not rabid skinhead racists such surprising news that it merits an article in The Spectator? The metro-left have their fixed views of Brexiteers and Ukippers – basically ghastly, uncultured people with a blinkered, nationalistic worldview bordering on overt racism. Generally they hold these views not because of any personal experience meeting and talking with Brexit supporters, but rather because this caricature draws a neat contrast with the virtuous traits of openness, tolerance and progressivism that the Left love to claim as their own. This much is all well known. But most of these views are formed at a great distance removed from the actual Brexiteers or Ukippers being judged. When Channel 4 filmmakers produce a dystopian documentary about what Britain would be like under a UKIP government led by Nigel Farage it is achingly obvious that nobody involved in the feature knows or has ever taken the time to get to know the type of people they so readily pastiche for the lazy consumption of their fellow metro-leftists. But once in awhile someone from the metro-left bubble accidentally stumbles out of their hermetically sealed ideological environment, finding themselves deep in the heart of Brexit supporting suburbia, or – heaven forfend – UKIP country. And when it turns out that the primitive, simple UKIP natives turn out to be perfectly decent people who just happen to hold different views on a few political issues, it is now apparently such shocking and revelatory news that it merits a whole article in The Spectator. Most people would say UKIP lends itself to comedy better than Denis Healey’s eyebrows lent themselves to tweezers – but not the people of Walton-on-the-Naze, as they live in the party’s only constituency. I’m a stand-up comic, and I was booked to play the town’s first comedy night this month. I don’t know if the lovely promoter realised I was Asian when he booked me; for my part, I didn’t realise Douglas Carswell was Walton’s MP, and only discovered while Googling the town on the way to the gig, when it was too late to turn back. When I arrived in Walton-on-the-Naze’s large ballroom with its cornicing and chandeliers (‘It looks like the inside of a prostitute’s wedding cake’ remarked one of the other comics), I was perturbed to see more skinheads than at your average EDL rally. Audiences in London are diverse both in terms of race and class; Walton’s audience was not. The first act quipped, ‘I know you’re all a bunch of racists’; whether he was joking or not wasn’t clear. I was terrified before I went on. I generally sing a love song to Jeremy Corbyn; I thought ‘Oh no, they’re UKIP supporters – they’re going to hate it.’ I also sing about the time a beauty therapist waxed my bikini line into a Hitler moustache. Ridiculously, I thought ‘Maybe some of them are neo-Nazis and will object to this, too!’ Before our sets, the other new comic and I shared frightened glances. ‘Good luck,’ he said. ‘Thanks – I’ll need it,’ I replied. ‘Hopefully they’ll think I’ve just got a suntan and am not Asian at all?’. I was glad that my six foot six inch male friend had accompanied me to the gig. Because we all know the seething hatred of Asian people in the heart of UKIP supporters and people who voted for Brexit? The condescension here is absolutely off the charts – first assuming that the people of Walton on the Naze are so stupid that Sherine’s clever little love ditty to Jeremy Corbyn might sail over their sloped foreheads, and second that the audience might start jumping around and flinging faeces when they realise that the person on stage is of Asian heritage. Is there some little-reported history of Asian comics going missing after venturing too deep into small-town Essex that I am unaware of? 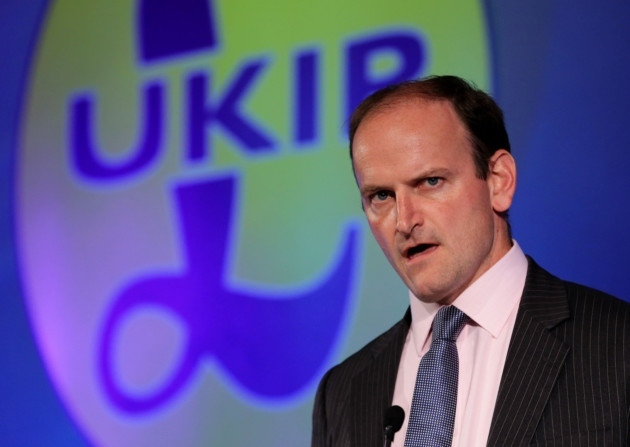 Has Douglas Carswell quietly imported the defunct Jim Crow laws from the American South, entrenching racial segregation and discrimination in a small corner of eastern England? This kind of foreboding and hysteria is only possible when one feels that the community in question are somehow fundamentally different to us, that they are “other”. But Ariane Sherine and her audience were both British, both English too, in fact. The idea of being afraid of one’s own countrymen because they happened to elect a mild-mannered MP like Douglas Carswell is absolutely absurd. In some ways, the crowd lived up to stereotypes: when the other comedian mentioned the referendum, he got heckled with ‘Brexit – out out out!’ And some of the crowd started to heckle the headline act when he maligned their hometown, with one man asking menacingly, ‘Are you taking the piss out of Walton-on-the-Naze?’ But whatever else the audience were, they weren’t racist. In fact, it occurred to me as we drove home, I was the prejudiced one, the one full of preconceived ideas about what other people were going to be like before getting to know them. Finally, the realisation dawns that perhaps it is the trendy lefty Londoner who holds prejudiced views – about her own countrymen, no less – rather than the much maligned white working class community which she was so alarmed to visit. One is torn how to respond to this article. Obviously it is a very good thing that Ariane Sherine came to see the error of her ways in having prejudged Ukippers and people from Walton-on-the-Naze. One only wishes that Sherine’s epiphany could be shared with every other young, creative-industry-working, Guardian-reading, Corbyn-supporting hipster living in London and the other big cities – and that the good people living in pro-UKIP or pro-Brexit communities might eventually start to feel more understood and respected as a consequence. But the fact that a comedian’s epiphany that people from a UKIP-voting town are not knuckle-dragging racists is such revelatory news that it merits a prominent article in The Spectator is depressing beyond belief. How is it possibly news that people in Walton-on-the-Naze didn’t racially abuse an Asian comedian and heckle her off the stage? When so many of our fellow citizens hold other groups – the white working class, Ukippers, whoever – in such open disdain, even fearing them, then we are in trouble as a country. And when established media outlets like The Spectator feel the need to publish One Woman’s Voyage of Discovery Into UKIP Land with a straight face, just to make a point, then it is clear that our media has a long way to go in terms of understanding the country they cover. This disconnect is why Britain voted for Brexit against the command and expectation of the country’s elite in the first place. Hasn’t the time come to give Britain’s silent, Brexit-supporting majority a little bit more respect? The prosperity we take for granted today couldn’t have happened without free markets and free trade. That doesn’t stop people – even presidential candidates – saying we’d be better off starting trade wars, and only buying goods made at home. But the fact remains: protectionism is the route to poverty. Globalisation gets a bad press. When manufacturing moves from Britain or the US to China and India, it looks like we’re losing out. But the result is that we get our clothes, shoes, computers, phones, and televisions much more cheaply. And lower prices don’t just make us better off. They also increase demand, and create jobs. As Adam Smith and David Ricardo realised 200 years ago, prosperity comes from specialisation. If each of us tried to be self-sufficient, we would all be living in prehistoric penury. Instead, we specialise in what we’re best at, and exchange the product of our work for what we need. The same applies to countries. Today, Britain’s comparative advantage is in services. Other countries are best at heavy industry or agriculture. By specialising in services, we get more and better manufactured goods and agricultural produce than we would if we diverted our resources into making them ourselves. Protectionism might seem like the solution for people who have lost out to globalisation. But its effect would be regressive – like the poll tax. It would force prices up, and employment down. That would hit the poorest hardest. Carswell goes on to argue that protectionism does not bring prosperity, but rather leads to inefficient, monolithic corporations like British Leyland, churning out low quality product that nobody really wants – and even then, only at the cost of massive subsidies from the taxpayer. The case against protectionism cannot be restated enough at a time when globalisation and free trade is under sustained attack on both sides of the Atlantic – by the otherwise polar opposite Donald Trump and Bernie Sanders in America, and by the worst elements on both sides of the EU referendum debate in Britain, who believe that we should retreat either into mercantilist isolationism or protectionist euro-parochialism. There is an important debate here to be had among advocates for smaller government. Clearly the state is presently far too involved in our lives in all manner of ways, but surely one of the things that a smart, lean and effective small government absolutely should do is watch out for its citizens when they are impacted by massive changes to the way that the world trades and communicates. Labour’s solution has been to park people on welfare and then forget about them, which is remarkably immoral for a group of people who love to endlessly brag about how virtuous and compassionate they are. The intelligent Right should come up with something better. And that means doing something more than simply aping Labour policy by raising the minimum (or “national living”) wage to £9 an hour so that the most tedious of low-paying McJobs keep people just out of working poverty. The new permanent majority will not be secured by the Cameron / Osborne strategy of enacting Tony Blair’s fourth term of New Labour governance. It will come about by radically rolling back the state in all manner of areas where it should be doing less, while also giving citizens the tools and opportunity to prosper in the new economy. Less protectionism, less pretending that the old jobs will come roaring back if only we leave the EU, embrace the EU or otherwise throw up barriers to global trade. Less shooting for the middle all round, and more empowerment of British citizens to pursue high value-add, high-wage, twenty-first century careers. Now put that on a bumper sticker. While covering last month’s UKIP party conference in Doncaster, I caught up with Douglas Carswell, UKIP’s sole MP at present, as he roamed the conference venue chatting with delegates and posing for the inevitable selfies. I was interested to hear the MP for Clacton’s thoughts on how UKIP might regain its momentum after a stratospheric rise in support was kept unfairly in check by the UK’s first-past-the-post electoral system, as well as what future the party might have following the referendum, once Britain has either voted to leave the European Union or repudiated UKIP’s entire world view by voting to remain. 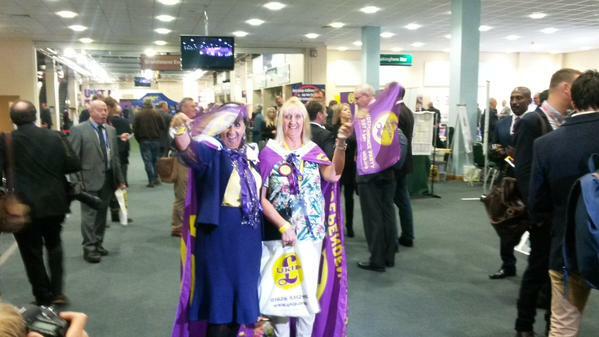 QUESTION: What would constitute a win for UKIP conference this year? Obviously it’s a bit lower-key this year than last year when you were able to announce the defection of Mark Reckless, so what’s the ultimate goal this year? DOUGLAS CARSWELL: Well actually, the interesting thing is everyone said it was going to be quite low key. I’ve been here for ten minutes and it’s been pretty full on, there’s a real buzz. I think there’s a feeling of real excitement. We’re going to have this referendum. We’ve been campaigning for it for twenty years, and it’s happening, and we can win, but we can only win if we work together and I think that is beginning to happen and it’s incredibly exciting, it’s wonderful to be here. QUESTION: So looking beyond the referendum, in five years at the next post-election conference the referendum will have happened, we might have another government. 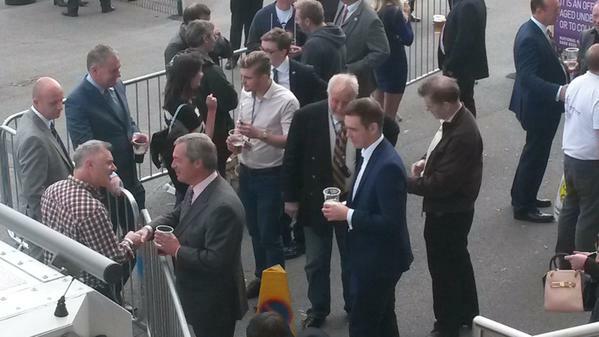 What does UKIP need to do to stay relevant in that time, other than the Brexit referendum? DOUGLAS CARSWELL: There are a whole range of policy areas from forced adoption to a lack of bank reform to the great energy cartel – there are a whole range of policy issues that we need to address, and we are addressing. And we’re making it clear that Comrade Corbyn’s Labour Party doesn’t offer any credible change, the Conservative’s won’t change because they are part of the cartel, UKIP stands for change. These are a whole range of areas besides the Europe question, but you know we were founded twenty-something years ago to ensure that Britain left the European Union. Let’s rise to the occasion and win that referendum. 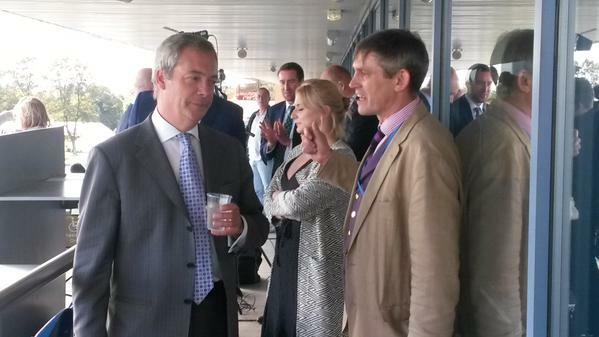 QUESTION: And finally Douglas, UKIP is an interesting coalition of different voters at the moment. You’ve got disaffected Labour voters, you’ve got right wingers and libertarians and others. How do you keep that coalition together once the unifying factor of an EU referendum is passed? DOUGLAS CARSWELL: It’s actually surprisingly easy. If you look at some data that appeared in the New Statesman recently, it showed very clearly that the Labour voters that Jeremy Corbyn needs to connect with actually have a view on the free market that is far more closely aligned to the unapologetically free market views of UKIP. We are in a much better position to appeal to ordinary working class people in this country who will never vote Conservative but who realise that Jeremy Corbyn’s welfare-ism, open borders policies and deficit denial are not credible. UKIP can come up as a credible voice for change, as a party that will break open the political cartel and tackle the corporatist economic injustices that are so prevalent in the country today. But the way to do that is not to offer reheated socialism – not Ed Miliband Mark Two. The way to do that is to be unapologetically free market. You’re filming this from an iPhone. An iPhone that is the collective endeavour of tens of thousands of people across the planet. We need to be a party that believes in the market, in free trade, in taking the best and the brightest from around the world in order to raise living standards. And that is something that I think people right across the political spectrum recognise as credible. 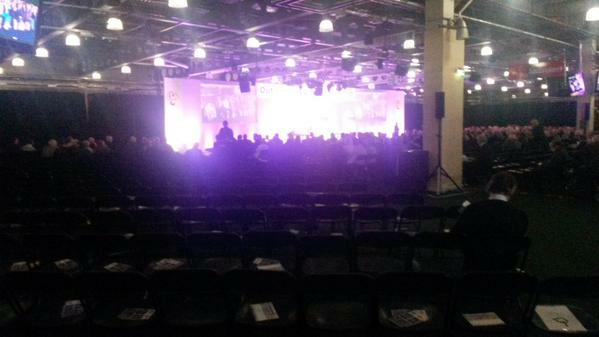 My live blog from Day 1 of the UKIP 2015 party conference is here. 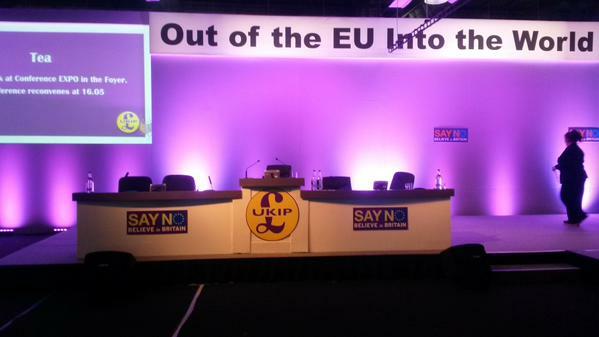 My live blog from Day 2 of the UKIP 2015 party conference is here.